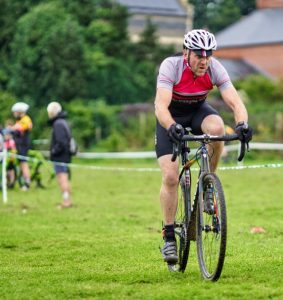 Workshop Technician Nic competing in the 2018 Welsh Cyclo Cross series. What is/are your experience or qualifications? As far back as age 10, I recall fixing my and friends bikes, borne out of a desire to understand how things work. Following a lengthy career in IT Engineering, I trained as a youth worker and began running the Duke of Edinburghs award bicycle repair programme. In the last 8 years, I’ve progressed from a confident home mechanic to a professional, Velotech qualified, experienced cycle technician and mechanic. I served my apprenticeship during the four years I worked at Muddybumbikes and now I split my working week between Cardiff Cycle Workshop and Ride Bike Wales, providing me with opportunities to work on low tech, every day commuting bikes, through to high tech, internationally raced, triathlon bikes. What kind of riding do you do? I love exploring, and I‘m happiest on a gravel adventure bike, preferably on some remote wilderness track in Mid Wales. I also have a strong addiction to long distance Audax rides, having completed a couple of one day 400’s and two day 600km rides in the last two years.I also really enjoy sharing my skills and passion for off-road cycling, and lead a weekly gravel bike ride, “the Tuesday Traverse” as well as coaching at Whitchurch Cycling Club. We all know about “N + 1”, what is N equal to in your shed/house/garage/lock up? IE; How many bikes do you own? 3, no wait 4. Are we talking about whole bikes? what about frames, do they count as bikes? Then there’s the one, no two that I need to sell – wait will my wife get to read this? just 3 it is then and a folding bike, does that even count as a bike? What’s the favourite bike you’ve ever had? Working in a bike shop for the last 5 years is an occupational hazzard, there’s always a new bike on the horizon. Right now, my gravel bike is probably the best bike I’ve owned and it is it’s versatility that makes it so special, titanium frame from Lynskey coupled with the 1×11 Sram groupset and an amazing 3T fork, shod with tubless 700×40 WTB nano tyres – a Cross / Gravel / Pavé kilometer eating machine. Have you got a cycling hero/heroine? The late Mike Hall, for so many reasons, his approach to bikes, racing, exploring, training, sharing knowledge and love for cycling…….#bemoreMike look it up and hopefully you’ll be inspired to ride just that little bit further than you feel comfortable with. Any hopes or thoughts for the future of cycling, cycle sport or cycling tech? My hope was the Welsh Assembly government would have held fast to their proposals to open up access to more of Wales’ amazing countryside for cyclists, yet despite an overwhelming positive response they have shrunk back from their own proposals and delayed increasing access, and in doing so have missed an opportunity to help tackle the very real health problems associated with high levels of physical inactivity and a much needed boost tourism and the economy in Wales.